Story and photography by Larry Miyamura. Click/tap an image to begin a captioned slideshow. 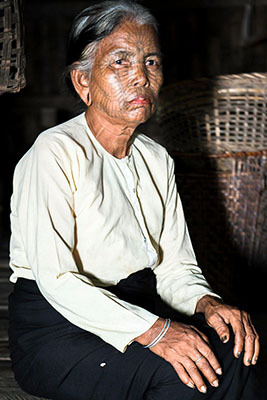 The tribes of the remaining tattooed ladies of Myanmar (Burma) are concentrated in the western region in Chin State. There are many legends purporting to explain why these ladies were tattooed between the ages of nine and fifteen. The most accepted legend is that they were tattooed to make them unattractive after an 11th. Century Burmese King kidnapped one of the local girls and made her a concubine. Over a period of time the tattoos became a sign of beauty. The practice was outlawed in 1962 when the military junta came to power. 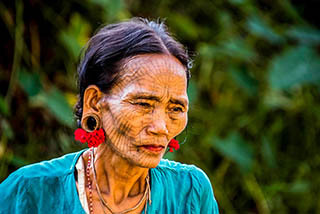 Estimates of the number of remaining tattooed ladies vary, but the youngest would now be in her late sixties and life expectancy in this remote area is not very high. The region is very primitive. Water has to be collected from the nearby river in aluminum urns; electricity has not reached the area and gasoline powered vehicles are rare or non-existent. The only roads are traveled by ox cart. The area was closed off to visitors until 2013. 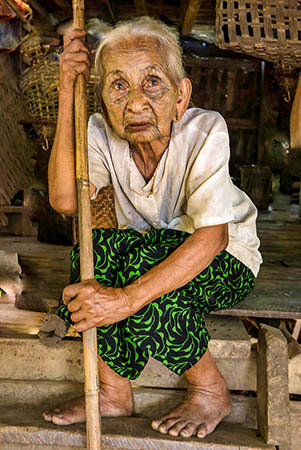 A brutal military junta ruled Burma from 1962 to 2011. The junta imprisoned any dissenters and the human rights violations were extreme enough to invoke sanctions for decades. The United States did not lift those sanctions until 2015. 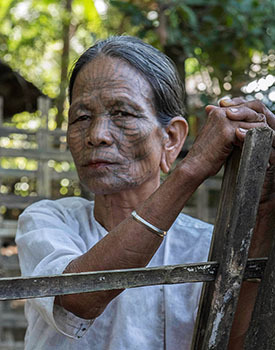 In November, 2014 two photographer colleagues and I flew from Yangon to Sittwe to meet our guide with the intention of photographing the tattooed ladies of Chin State. Sittwe is a major fishing village for western Myanmar and we got to photograph the local fish auction. Some of the fish that do not find a buyer are dried and sold as food for animals. The pungent smell of drying fish permeates everything. 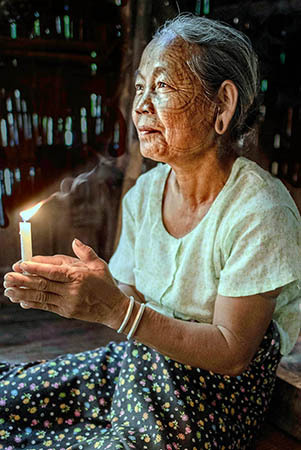 Sittwe is also the epicenter of the ethnic cleansing of the Rohingya, who are primarily Bangladeshi Muslims living in Burma, which is mainly Buddhist. At that time it was estimated that up to half a million Rohingya lived near Sittwe in deplorable conditions. In more recent times a genocide has occurred after a Burmese military outpost was attacked by Rohingya rebels. The attack provoked the Burmese generals to send army troops to torch Rohingya settlements — with estimates as high as 3,000 Rohingya killed and many rapes committed by the soldiers. Most of the Rohingya fled to Bangladesh or Malaysia hiding in the jungles. It was hard for me to believe this could happen because of Aung San Suu Kyi, who was awarded the Nobel Peace Prize in 1991 and who has been the de facto leader of Myanmar since 2015. I was told that the ruling generals rewrote the Burmese constitution in 2008 with language that barred Suu Kyi from becoming president because her two sons are British citizens. The revised constitution also reserved a quarter of the seats in parliament for the military, which prevents the constitution from being rewritten and states that the military is a separate entity not under the control of the president or parliament. After a night in Sittwe we boarded a noisy, leaky wooden boat for a five-hour boat ride up the Kalandan River. The boat could best be described as primitive with wooden benches for seats and no cushions. The diesel engine was so loud you had to shout to converse — sort of like being in a noisy disco. Sleep was not an option. We disembarked in Mrauk U which was the center of the Arakan Kingdom from the 15th. to 18th. Centuries. Some of the richer Arakan rulers in that era hired Japanese Samurai as personal bodyguards as they were famous for their fighting skills and, more importantly, their total loyalty to their masters. Early the next morning we took a two-and-a-half hour boat ride to the nearest Chin village. As this river was smaller than the Kalandan the boat was much smaller, just as noisy and more uncomfortable. At least the scenery was more beautiful with more vegetation and small fishing villages along the shore. As photographers we had hoped to be able to photograph the villagers in early morning or early evening light, but with the long boat rides it would have required the boat drivers to run the boats in the dark and they would not agree to that. 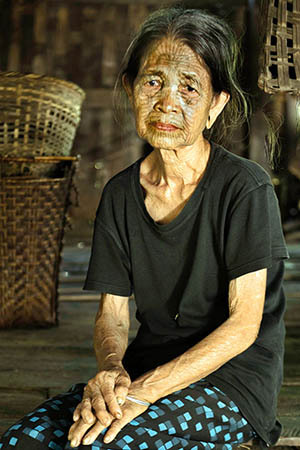 The first Chin village is the one most visited because of the long boat ride but we only saw three tattooed ladies. The village we visited on the second day was another long hour further upstream but there were nine ladies. The ladies from the second, more distant village were more accommodating and easier to work with. They were not as jaded as the first group of ladies as they had less dealings with the strange requests of photographers and tourists. We intended to photograph the ladies engaged in their daily routines rather than just photographing the facial tattoos. 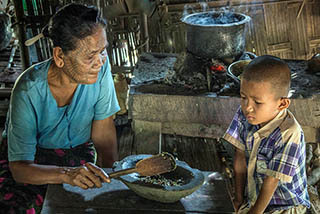 As in most Asian cultures the women do all of the cooking and housework and child raising. They are mostly farmers and live off of the land. It seemed the villages were self-contained with only minor interaction among them. 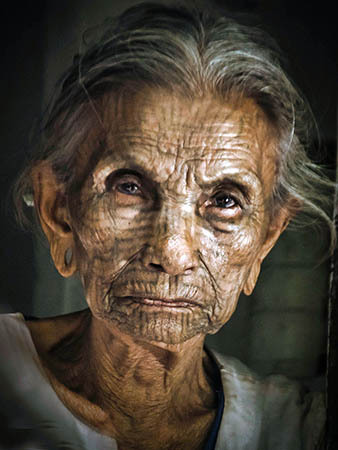 One of the legends as to why the women were tattooed was that each village used a style unique to that village so their women could be identified if captured or kidnapped. The tattoos we saw in the two villages we visited looked similar to us. Everyone in the village is expected to work. They explained it very simply: you don't work you don't eat. We compensated them well for their time as we intruded into their daily lives. We asked our guide what we should pay the ladies. Putting things into perspective: At the time we were in Myanmar the exchange rate was one US dollar to 1,000 Burmese Kyat so our dollar went a long way. We were told that the average wage in the cities was about $4 US per day. We paid the ladies the equivalent of $5 US for about an hour of their time. We interviewed a few of the women. They did not remember many of the details as they said they were only nine or ten years old at the time. They did remember that it hurt. The process took at least two days and the recovery took almost two weeks. As everyone was expected to work, even young children, they were not allowed much time to recuperate. The biggest fear was infection. Antibiotics were not available in the villages. 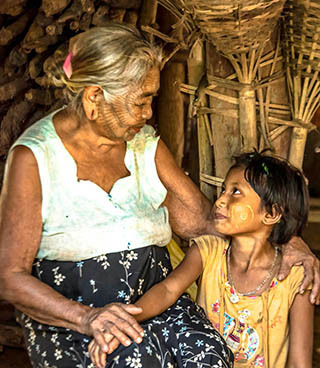 The closest thing to a doctor is a person in a nearby village who would be similar to a herbalist/healer. 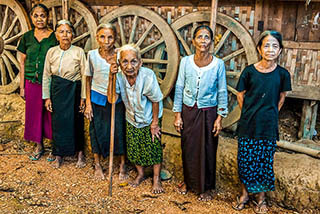 A serious health problem would involve hiring a boat to take you to Mrauk U. Burma as a country is rated among the worst in the world for health care. Almost all of the tattoos were black. We also interviewed a lady who claimed she was one of the people who had tattooed some of the ladies (then girls) in the village. She said she used a large thorn from a local plant and the 'ink' was a concoction of ox bile, plants, animal fat and soot. The tattoos we saw in both villages were similar to a spider's web. One of the ladies we interviewed was very attractive and claimed the spider web tattoo on her face captured men just as well as the webs of spiders caught flies. Her tattoo was an attraction. Strange story as her husband and family were there for the interview. Other tribes used different patterns including some that covered most of the face. 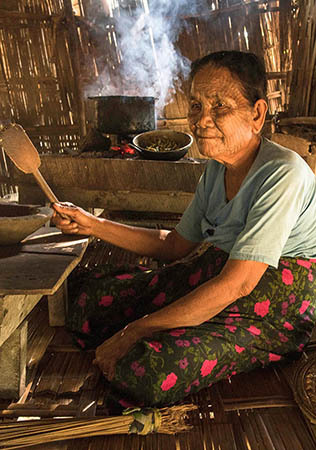 As we made our way back to Sittwe, and eventually Yangon, we discussed what we had witnessed. We had photographed some people who were isolated for most of their lives and had little contact with outsiders until a few years prior. Our guide worked for a large Burmese travel agency and he estimated only about 700 people a year make the journey to the remote tribes because of the hardships. Our fear was that these innocent people would soon become a freak show. 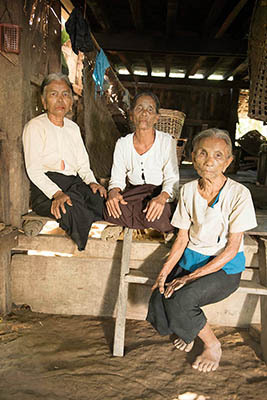 A bigger fear was that the Burmese government would do what the Thai government did to the long-necked women who fled Burma into Thailand. They put the long-necked women into an easily accessed fake village and turned them into a tourist attraction. Photography and text © 2018, Larry Miyamura. All rights reserved. Miyamura, L., (2018) The Tattooed Ladies of Myanmar (Burma). The Peoples of the World Foundation. Retrieved April 19, 2019, from The Peoples of the World Foundation.